One of the wonderful things about this little community on Xanga is how it connects you to creative and interesting people both inside and outside the community. Evan wrote a recent entry in which he linked to photographer Phillip Toledano’s online slideshow titled Days with My Father. Following his mother’s death, Toledano cared for his father, who had no short-term memory. The three years they spent together are beautifully captured through his photos and words. When you click on the link, it will take a few moments for all the thumbnails to load. Click on the upper left thumbnail to begin and then navigate through the slideshow by clicking at the bottom of each page when you are ready to advance. The navigation took me a few moments to figure out but it is worth it. Another Xangan, Jason, is part of the Vancouver BC-based band Locus. They just released their first album, Ambrosia. Described as “dream pop” their music is a combination of electronic, ambient and industrial rock. Listen to their beautiful songs for free on MySpace. 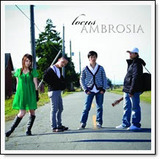 You can download the album from iTunes by searching for “Locus Ambrosia”. Add to this the many talented poets on Xanga and we have a very creative tribe here. This entry was posted in Uncategorized and tagged Locus, Music, Photography, Toledano by christao408. Bookmark the permalink. Very cool! there are indeed plenty of talent out here on Xanga. Really cool Chris. I loved seeing the slide show. Wow. Glad I came over! Thanks for the cool links! Chris, I don’t know what happened. I was still commenting, and the thing just got submitted, and I couldn’t edit. While I was saying that I enjoyed, ( may be tha’s the wrong word ), the slide show, I was crying at the ache and the agony that your friend faced.OMG! How raw and emotional to go through this. I am so happy that he had such a special time with his father, and had such fond memories of his mother,( the emptying of her closet really got to me), and above all, that his wife Carla with the dad when he passed away. Thank you Chris, for posting this heart wrenching account of life and death. God bless your friend and God bless you. That’s quite a touching project. Hopefully, when I visit my parents this Christmas, I’ll be able to “borrow” some of my family photos and scan them into digital images. Are you going to post some more of yours on Xanga, and make it an entry/story line? and you are interesting,too. Leaving way off in Thailand and getting married recently. @ZSA_MD – Thanks, Zakiah. In full disclosure, the photographer isn’t someone I know. His website was brought to my attention to by another friend on Xanga. @chow@ireallylikefood – Agreed. @Roadlesstaken – Yes, indeed. You were going to film some performance art and share it with us, right? =D@SamsPeeps – Glad you came over, too. Thanks for the recommendation. @CurryPuffy – Between the scanned family photos and more than 200 rolls of negatives I’ve had scanned, there is a lot of material. It is just a matter of working it into the flow of stories. There are so many other things to write about! @yang1815 – Yes! @secade – It deserves to be heard more broadly. @Jillycarmel – Very nice of you to say. @christao408 – you are a nice guy so it’s easy to say. @onmovement – You’re welcome. Keep making the music. Thanks for the delightful links to interesting people! The slide show was a wonderful tribute from a son to his father. @murisopsis – You’re very welcome. The interesting community is what made me stay with xanga for 7 years now! =DAnd that online slideshow is seriously inspiring me to do a photo project with my family.